I have had a sewing machine for about 5 years now but have stuck to pretty simple (in my opinion) stuff. Lots of basic skirts for the girls and I was on a bunting kick for a while, had to have a different bunting for every occasion and even made some for friends. One of my best friends is due to have her second little girl at the end of May and I had been trying to figure out what to get her as a gift. She didn’t want a big baby shower and was finding a lot of what she needed second hand. I kept on thinking it would be nice to make her/baby something more personal, I was looking on Pinterest (yes I’m addicted) for inspiration and finally decided I was going to attempt to make a quilt! 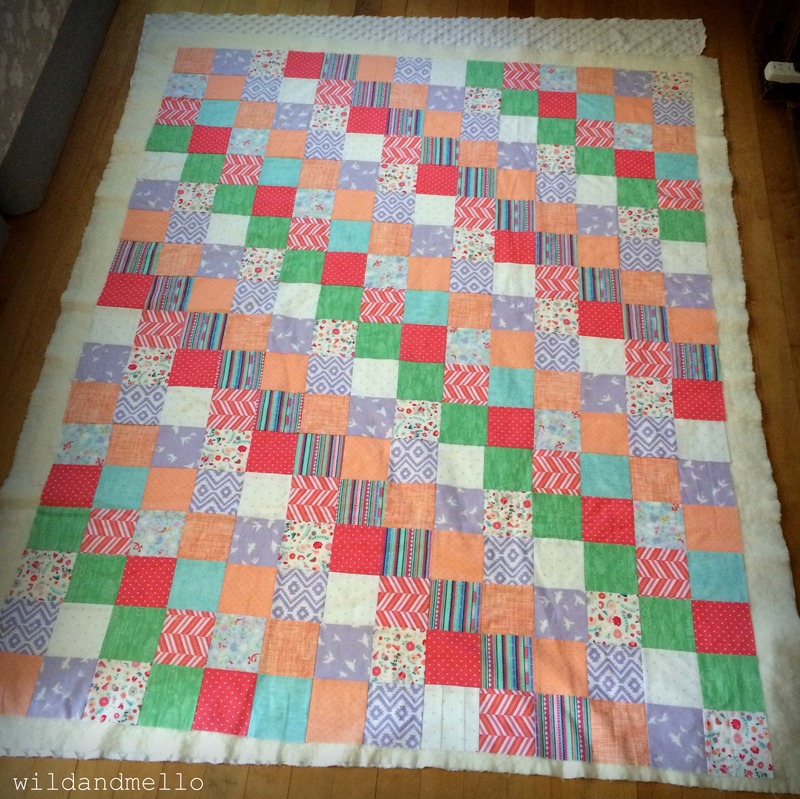 I don’t feel qualified to write out a tutorial and I used several different ones I found via Pinterest, here is my “Quilting” board if you want to check it out! Luckily my mom watched the kiddos so I could go to Fabric Depot “real quick” to pick out fabric, definitely took way longer than I thought it would. I didn’t really have an idea for colors but decided to go with a very colorful palate. 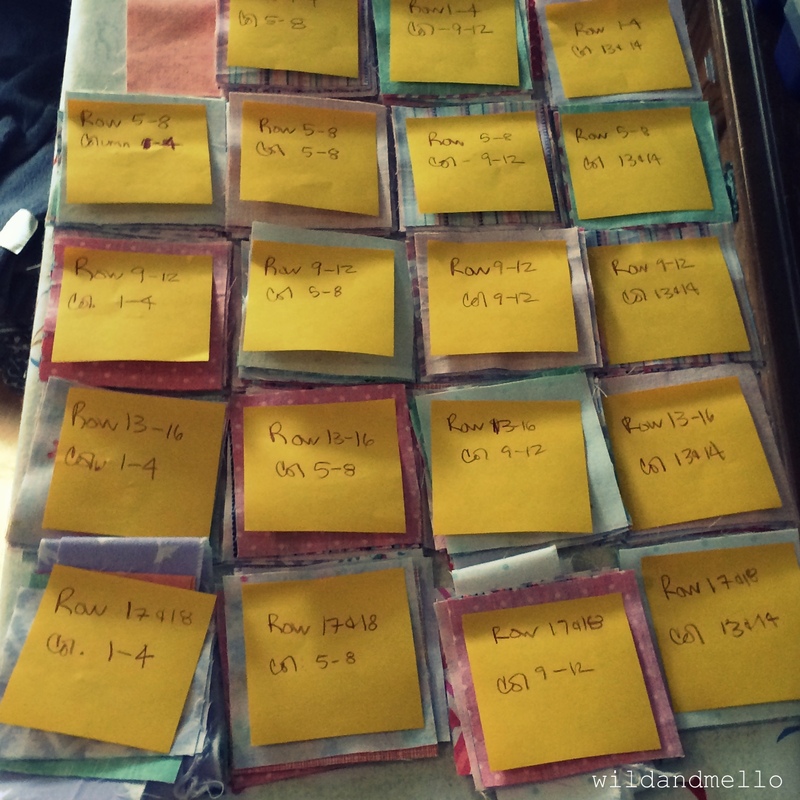 I then washed/dried and ironed all of the fabric so it was ready to be cut up, I had decided to do 3″ finished squares so I cut out 3.5″ squares. 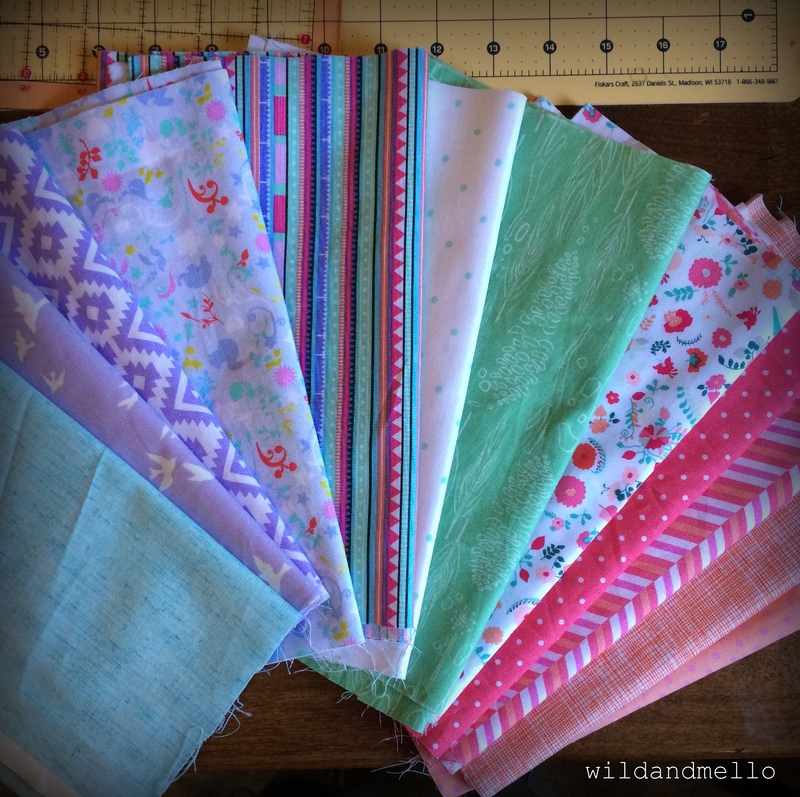 I had purchased 1/4 yard of 12 fabrics but if I do another quilt with the same measurements I would get a 1/3 yard so I could cut out more squares with less scrap left over. After I cut out the squares I spent a while figuring out the layout, I had thought I would just randomly lay out the colors with no actual design but in the end I did not like that and needed some order to the colors. 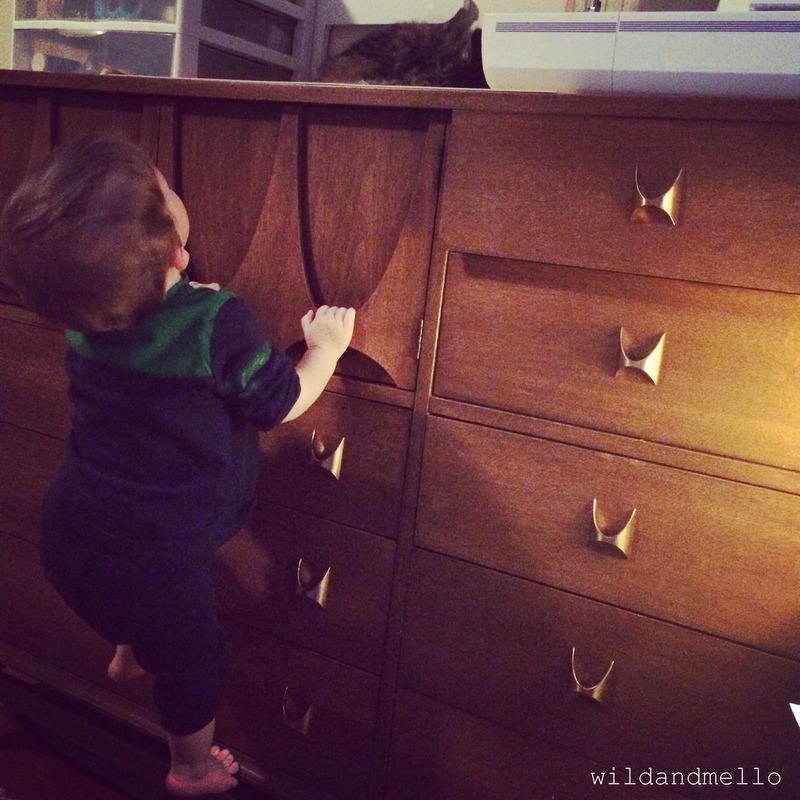 ← My awesome Broyhill Brasillia dresser craft space and → my little helper trying to see the cat. Once I got all of the squares laid out I made little piles to organize them, I knew I wasn’t going to be able to sew it all at once and didn’t want to just collect them all up randomly and then try to put it back together. Then it was time to sew! I did it in 4×4 sections (across) and then would sew those together and then once I completed it all the way across would sew together the next chunk of rows, etc… Now I had to make the quilt sandwich, the top, the middle (batting) and back (which I choose a white minky dot). I then pinned the crap out of it to make it stick together so I could start the actual quilting, I had to roll up the sides and hold the bulk of the fabric so it didn’t pull on the needle but I think that’s just due to my set up. In a lot of the tutorials I looked at they sewed straight lines on both sides of each line (like this) or had quilting machines and could do crazy designs, I decided to keep it simple and do diagonal lines. I then trimmed the edges so that the quilt was square and ready for the binding! I had envisioned a navy blue tiny white dot polka dot fabric and when I went to buy it I couldn’t find exactly what I was looking for but it was close enough. I didn’t want something pastely or light and did look at some bright reds or purples but in the end the blue won. 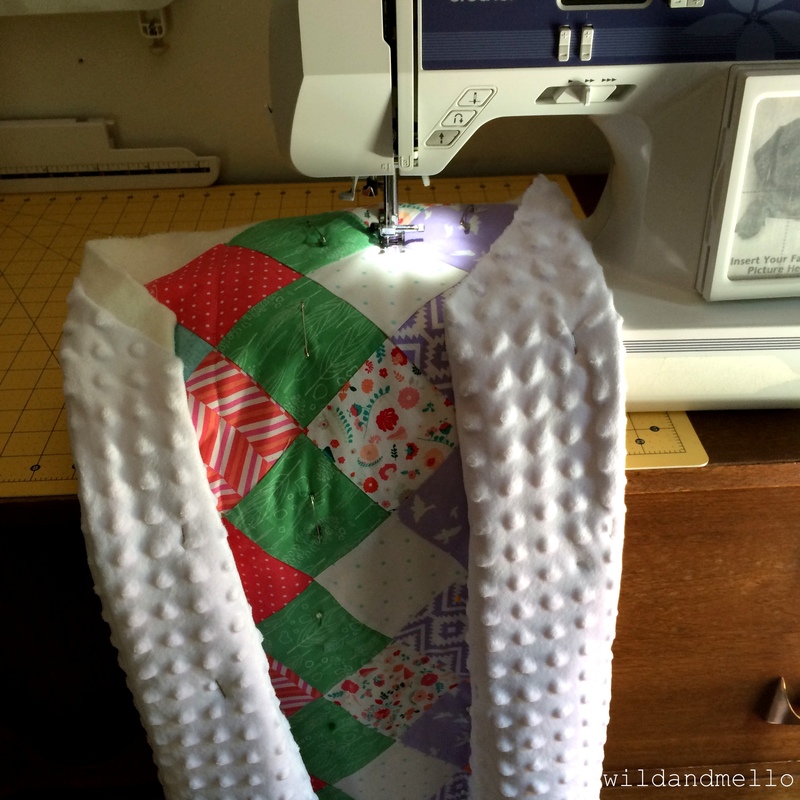 The fabric was on sale so I bought a yard which was way more than I needed and just cut the strips and then ironed them, following this tutorial. 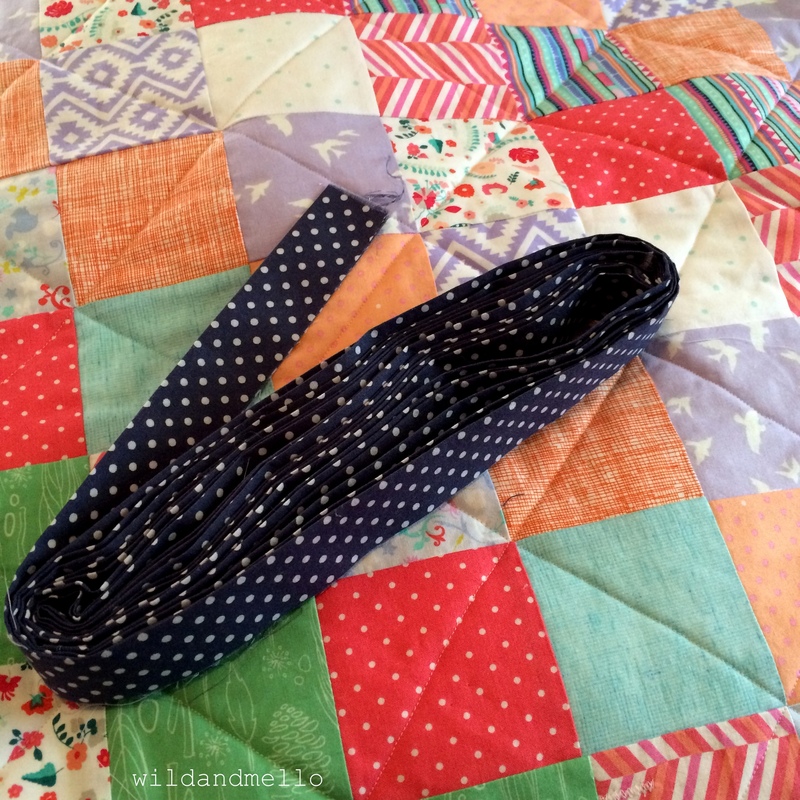 I then pinned the binding on and started sewing! 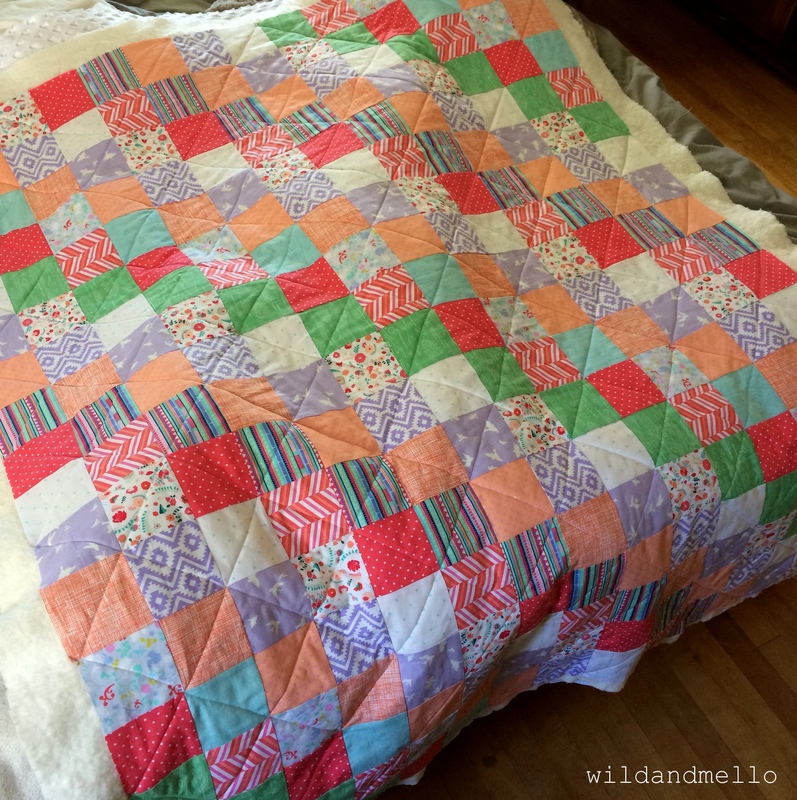 Fabulous first quilt! I hope your friend loves it. 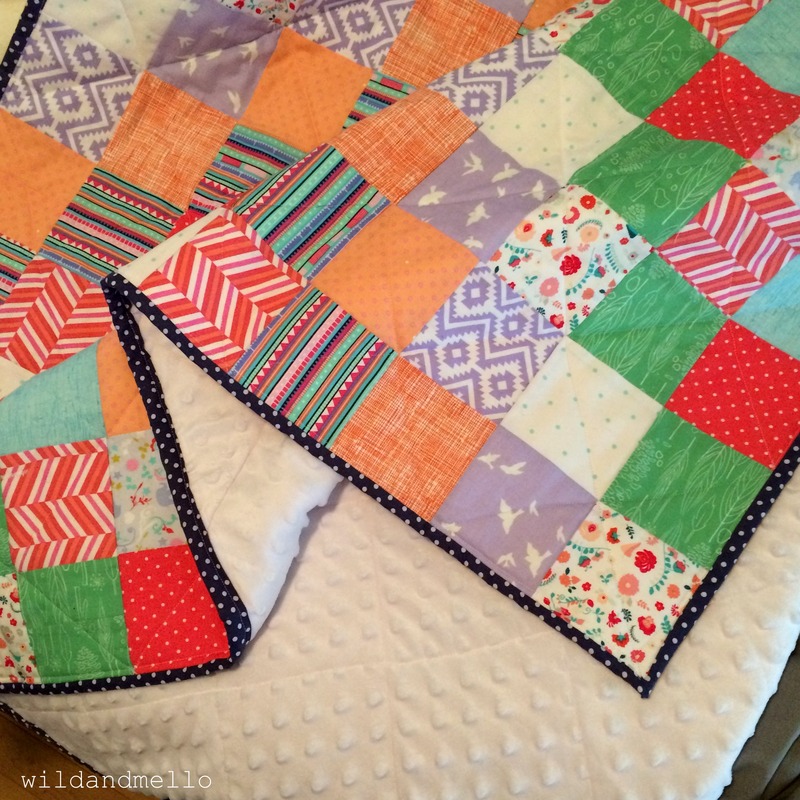 With a second child, I think it is easy to forget that certain things, they should have one of their own, and one of those things is their own quilt. What a great idea you had for her! I like the design, simple but organized. Great effort! 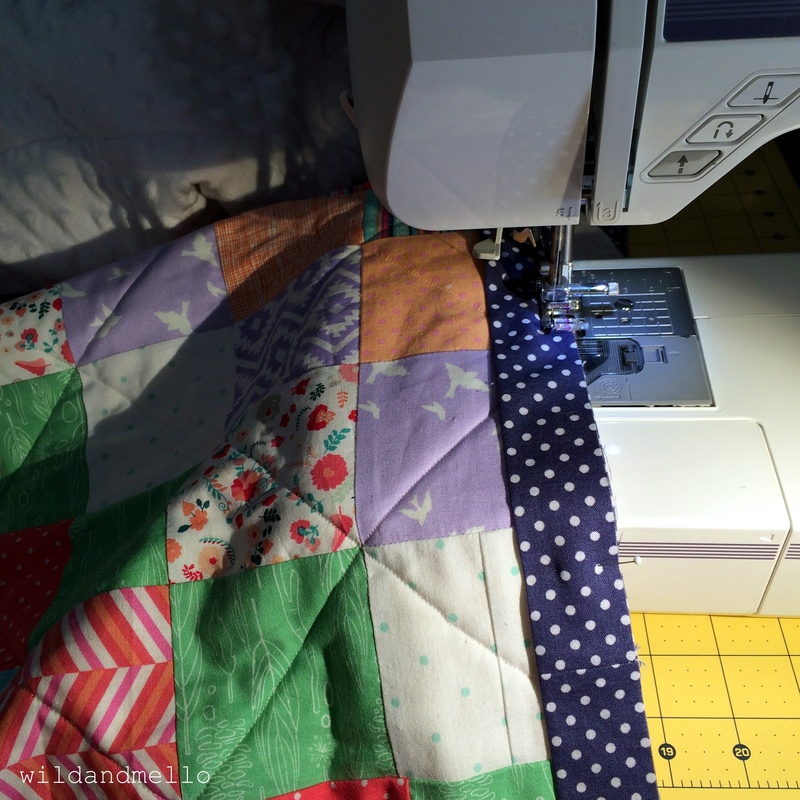 Such great work quilting minky for your first quilt! It looks fantastic, and I really love the contrast between the binding and quilt top.